In my previous post, I outlined a key problem facing insurers today: many are investing a significant amount in innovative technologies, yet are struggling to unlock their true potential and release trapped value in their business. 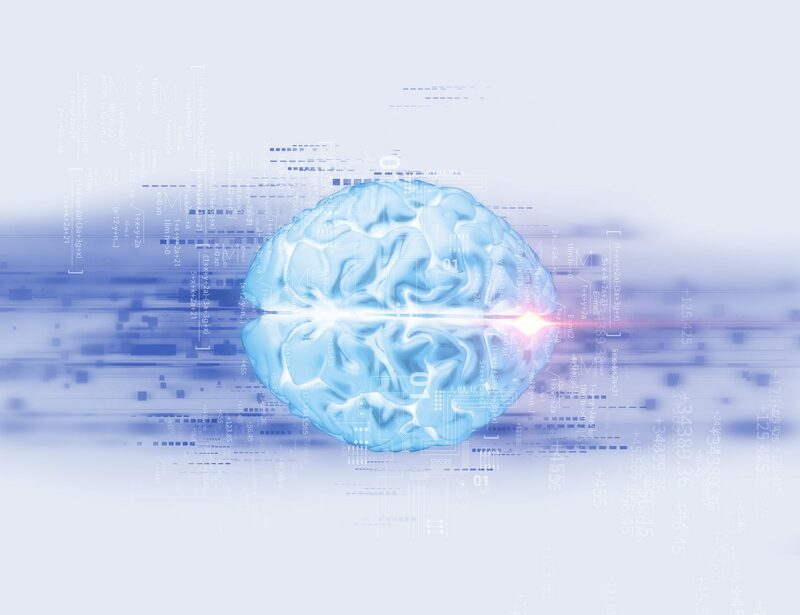 In this post, I’ll discuss how insurers can use advanced technology such as artificial intelligence (AI) and intelligent automation to reduce costs, enhance operations and improve efficiency to future-proof their organizations. In our research on “The New, New Normal: Exponential Growth”, 56 percent of executives agreed that AI deployment will drive new growth and revenue opportunities by accelerating new products and services. Fifty-eight percent said that AI-enabled revenue growth will come from increased customer satisfaction and engagement; while nearly 50 percent believe it will spur a change in their business models. In the 2017 Technology Vision for Insurance survey, 76 percent of executives said AI would significantly or completely change the industry in the next three years, while 72 percent believed it would have a similar impact on their organization. However, fewer than half of the executives interviewed said their companies were implementing comprehensive AI programs across their enterprises. What do those companies that are successfully deploying enterprise-wide AI programs have in common? Accenture Strategy surveyed 1 100 executives across the globe to gauge AI adoption, the technology’s use in the enterprise and its role in driving value. Financial services executives know that AI should be a critical piece of their competitive strategy. Two-thirds of our respondents identified it as a top strategic priority, and 85 percent said it will create new categories of products, business models and markets. But most companies are stalled in pilot phase or early stage AI adoption. The problem is that many organizations are implementing the technology in silos and discrete projects—an approach that won’t get them to unleash their true potential. 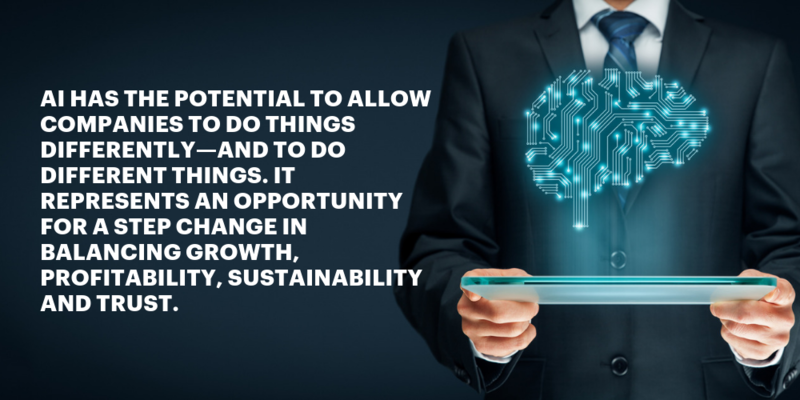 They understand that AI is more than just a tool or technology—and see it as a transformative capability that accelerates opportunity inside and outside the business. They experiment and learn, knowing that the more data companies feed AI, the smarter it gets. They turn obstacles into opportunities—and they take a continuous, iterative approach. They use challenges to fuel AI-driven insights. Claims management Intelligent solutions can automatically process claims data, spot potential fraud and analyze trends in fraudulent activity. 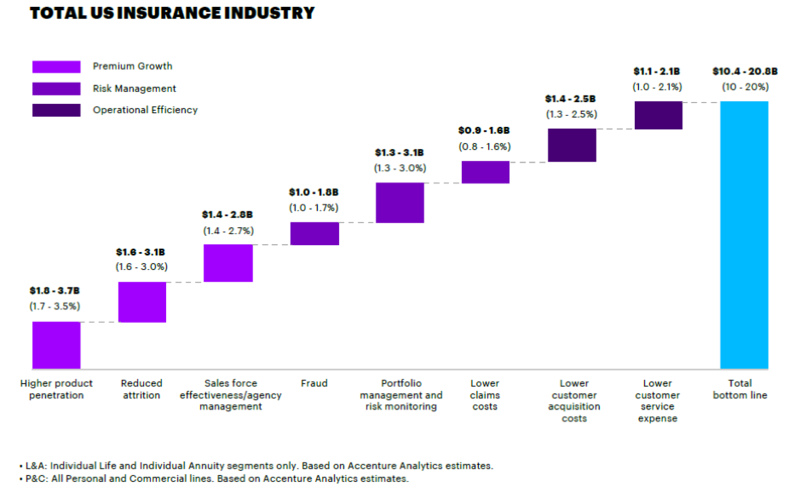 An Accenture life and health client expects to cut its handling time for illness and disability claims from 100 days to 5 seconds by using a combination of optical character recognition, text analytics and machine learning. Underwriting These solutions can help extract information about key risk factors and automate identification of product trends linked to demand and profitability. Sales AI can alert agents to prospects who are ready to buy, helping to drive higher conversion rates. Product and pricing Intelligent data analysis can incorporate a wider range of risk factors to more accurately price risk. The customer experience Process automation is enabling whole new levels of personalization and convenience in customer service. Co-op insurance customers in the UK can receive an automated insurance estimate after answering four questions from a chatbot on Facebook Messenger.